Watching Avatar is like gazing upon a cityscape from a high-rise building — you find yourself looking up, down, left, right and eventually all over. Your eyes and head are constantly shifting because you don't want to miss anything. If any film demands to be seen in the theater, this is it, and a 3-D theater at that. The movie is truly a wonder to behold and experience, so imaginative, moving and alive. Writer-director James Cameron has been a constant entrepreneur for the cinema (Terminator 2, Titanic); this time, he outdoes himself. As I type this review, I'm overcome with the urgency to see the movie a second time, perhaps a third, because I know it won't be in theaters forever, and as good as home entertainment is becoming, it just can't do some movies justice. Avatar is likely one of them. The film takes place approximately 150 years in the future and centers on an ingenious concept, even if the story itself feels overly familiar and derivative. On the far-off planet of Pandora, a U.S. corporation wants to mine the land for a rare and valuable element called unobtainium. The only thing stopping them is Pandora's indigenous race, the Na'vi, who have tall, lithe bodies, blue skin, and tails. The Na'vi pride themselves on their natural, uncompromising lifestyle and live in harmony with their surrounding plants and animals, with which they make a spiritual and physical connection. They're onto the humans' desire to "civilize" Pandora for financial gain and justifiably meet them with hostility, which is where Dr. Grace Augustine (Sigourney Weaver) and her brilliant team of scientists come in. They've developed Na'vi/human hybrids that are controlled through brain signals. Humans jack in and control the bodies through neural sensors while their physical bodies rest in a structure that resembles a tanning bed. 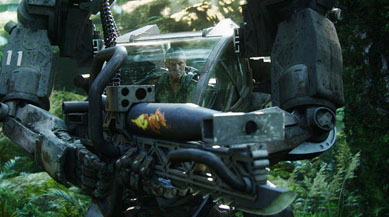 It is the humans' hope to communicate with the natives and establish peace before the military, led by the overzealous Colonel Quaritch (Stephen Lang), move in with force. One of the men originally assigned to the avatar program was the twin brother of Jake Sully (Sam Worthington), but he was killed in combat, so now Jake, who's paralyzed from the waist down, must fill his brother's position because he has a similar genetic makeup. Jake quickly adapts and marvels in the body with its fully functioning legs. When he's taken outside the military compound to explore Pandora, he picks a fight with one of the endemic creatures and is rescued by a real Na'vi woman named Neytiri (Zoe Saldana). She presents him before her tribe, including her mother (CCH Pounder) and father (Wes Studi), who order Neytiri to teach Jake the ways of their world so they can learn more about him. Naturally, as Jake and the betrothed Neytiri spend more time together, they develop greater affection for each other, and Jake makes a deeper connection with Pandora and its people. The central story of "Avatar" calls to mind others like Shogun, Dances with Wolves, Braveheart and The Matrix. It's not the most original screenplay, but it is perfectly serviceable for what Cameron really wants to show us, which is breathtaking imagery of Pandora and its floating mountains, enormous trees and glowing waterfalls. There are also the intriguing concepts of how the Na'vi communicate with the native creatures and the futuristic technology. In the world of mainstream cinema, this is a one-of-a-kind world. Deep down, I wish Cameron had chosen a different path for the film's climax, which is more or less a glorified battle sequence (this is what most science fiction movies boil down to), but it's done so well and taken to such an extreme that I didn't really mind. We've seen battle sequences before, but not one this visually stimulating. I also wish there was more character development on the human side, especially since they're considered the villains. Cameron paints them merely as greedy, one-dimensional people caught up in their own military-industrial complex. I suppose they're adequate, but with more care and depth, the story might have risen beyond our expectations. Still, just as he did with Terminator 2, Cameron pumps Avatar with so much energy and kinesis that its narrative flaws and near three-hour running time seem like nothing at all. Avatar has been in development for 15 years, but no matter how long it took for technology to catch up with Cameron's ambitions, it was well worth the wait. It utilizes new techniques for motion capture and makes it more seamless and convincing than ever, especially in the eyes of the Na'vi characters. Unlike other motion capture films like The Polar Express or A Christmas Carol, where the characters' eyes appeared independent of their bodies, everything in Avatar feels connected. With a production window and budget so large, we should expect this film to be an unforgettable experience that we'd want to watch several times over. Cameron has accomplished such a feat before. Amazingly, he's done it again.